Another bend in the river and another arch bridge. This interesting structure was completed in 2007. It's a 350 ft long pony arch with two big box girders under the deck (see photo below). If you look closely you can see cables holding the end of the bridge to the ground. There is often an effort for bridges in Japan to match the color and texture of the surrounding buildings, which this bridge has successfully accomplished. In fact it won several awards for its appearance, shape, color, and details. 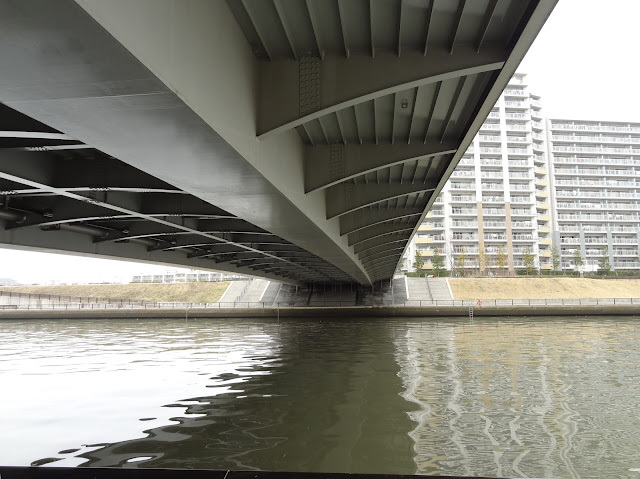 Tokyo, Japan's Bridges: Toshima Bridge across the Sumida River by Mark Yashinsky is licensed under a Creative Commons Attribution-NonCommercial-ShareAlike 3.0 United States License.